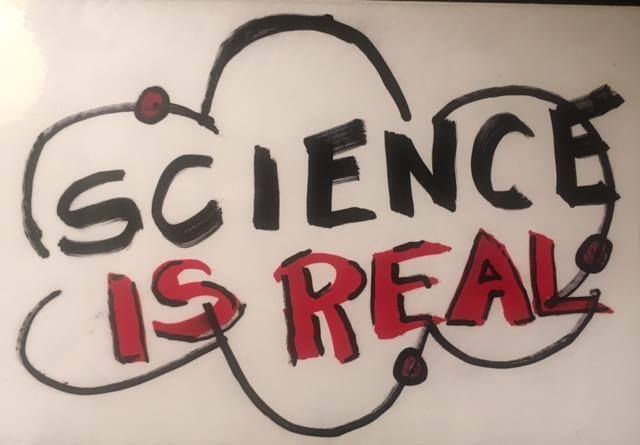 A postcard to President Trump from Deborah Bunka, via the March for Science Iowa Facebook page. Even before he was elected, commentators and experts noted a strong anti-science streak in Donald Trump’s rhetoric. Now that he’s been inaugurated, they’re calling him the most anti-science president ever. Trump is enacting an agenda that, at best, selectively supports scientific evidence and research. With the appointment of Oklahoma Attorney General Scott Pruitt to run the Environmental Protection Agency, it’s clear that climate change will be downplayed or dismissed in the Trump administration. Pruitt took a moderate stance in his nomination hearings, but now is proudly revealing his anti-science views. Earlier this month he said he disagrees with the overwhelming evidence that carbon dioxide is a primary contributor to global climate change. Trump and Pruitt are putting their words into actions. The administration has offered a plan to cut the budget for the EPA’s Office of Research and Development by 40 percent. The EPA as a whole would get a 24 percent cut. The National Oceanic and Atmospheric Administration (NOAA), a major climate research agency, also would get a severe reduction. Other proposals under consideration would roll back Department of Energy financing for energy efficiency and renewable energy and for research on reducing carbon dioxide emissions. Trump’s disdain for sound science goes beyond climate, however, and spans political parties. He’s given credence to the disproven notion that vaccinations cause autism and met with noted anti-vaxxer Robert F. Kennedy Jr. (of the famed Democratic family). It’s easy to pick on Trump, but in truth his election and views are just the culmination of years of attacks on science, evidence and research – attacks that aren’t solely from conservatives. Now, scientists and those who value research and evidence as a foundation for sound public policy are fighting back.